The Hot 8 Brass Band is a New Orleans based brass band that blends hip-hop, jazz and funk styles with a traditional New Orleans brass sounds. It was formed in 1995 by tubist Bennie "Big Peter" Pete, merging two earlier bands, the Looney Tunes Brass Band and the High Steppers Brass Band. In the wake of Hurricane Katrina, the Hot 8 Brass Band was propelled to wider prominence by an appearance in Spike Lee's 2006 documentary When the Levees Broke: A Requiem in Four Acts. 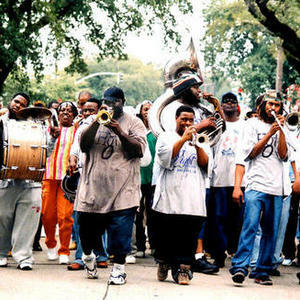 In the wake of Hurricane Katrina, the Hot 8 Brass Band was propelled to wider prominence by an appearance in Spike Lee's 2006 documentary When the Levees Broke: A Requiem in Four Acts. Because of this appearance, according to National Public Radio, "A new legion of fans caught onto the band's mix of traditional marching music, hip hop, and R&B." The band has also been mentioned in the media because of the deaths of three of its members through handgun violence. Hot 8 Brass Band have recently signed to the Tru Thoughts label, based in Brighton, England.